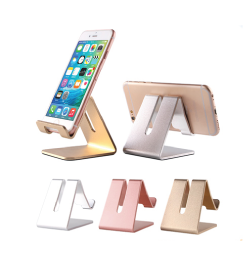 Universal aluminum desktop stand/holder for phone or tablet. Holds your phone or tablet in portrait of landscape mode. Angled support for easy viewing. Cable management on the back of the stand allows you to neatly organize cords when recharging. 4 rubber pads on the bottom of the stand prevent slipping or sliding. More rubber padding where your phone meets the stand to prevent possible scratching. Durable base keeps device steady and secure. Simple and minimal design for a modern look. My New Go-To for lapel pins!